Harlequins staged a strong comeback in the second half against Leinster but still fell to their first defeat of a fiercely competitive Pool Two. Leinster's European Champions Cup hopes hung in the balance after losing away to Quins last week, but Matt O'Connor's side are right back in the mix again. A try by scrum-half Isaac Boss helped Leinster build an 11-0 half-time lead. Mike Brown got a try and the English Premiership side led 13-11 but an Ian Madigan penalty secured the home win. It means both sides have taken five points from their back-to-back meetings and are tied at the top of the pool, with Wasps also in contention for a place in the knockout stages. 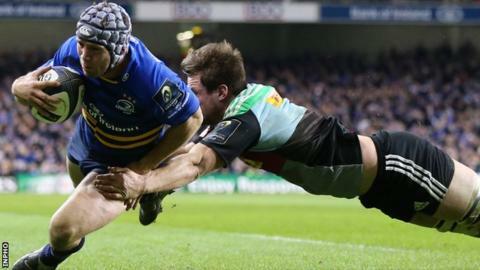 Leinster had looked in trouble when Harlequins staged a strong comeback in the second half. The visitors thought they had scored a try through full-back Brown in the 43rd minute but, after a lengthy TMO deliberation, it was disallowed for a knock-on by Joe Marler. Quins did get off the mark when South African fly-half Tim Swiel, who had missed two attempts in the first half, scored a penalty after a collapsed scrum in the 47th minute. Eleven minutes later, Leinster found themselves behind as Harlequins got a converted try. Centre Matt Hopper recycled quickly off the floor to keep the phases going and Brown finished off. Swiel's second penalty put Harlequins 13-11 ahead but a hands-in-the-ruck offence gave centre Madigan the opportunity to land the winning score for the three-time former champions. Quins finished with 14 men after lock Charlie Matthews saw yellow for raising his hands to Dominic Ryan's face during an off-the-ball incident. In the first half a try by Boss in between two Madigan penalties had put Leinster in charge. The try was scored in the 31st minute after number eight Jamie Heaslip had picked the ball up at the base of a scrum to supply his scrum-half. Leinster: R Kearney; Z Kirchner, L Fitzgerald, I Madigan, D Fanning; J Gopperth, I Boss; J McGrath, S Cronin, M Ross; D Toner, K Douglas; R Ruddock, D Ryan, J Heaslip (capt). Replacements: Reddan for Boss (50), Bent for J. McGrath (77), M. McCarthy for Douglas (58), Conan for Ruddock (64). Not used: B. Byrne, Furlong, Reid, M. McGrath. Harlequins: M Brown; M Yarde, M Hopper, G Lowe, A Tikoirotuma; T Swiel, D Care; J Marler, D Ward, W Collier; C Matthews, G Robson; L Wallace, J Clifford, N Easter. Replacements: R. Chisholm for Brown (75). Not used: Gray, Lambert, Sinckler, Twomey, Trayfoot, Dickson, Casson.